ASC-US = Atypical Squamous Cells of Undetermined Significance. Representing between 4 and 6% of total smears (2 to 3-fold of SIL fequency). ASC-US have a negative definition. 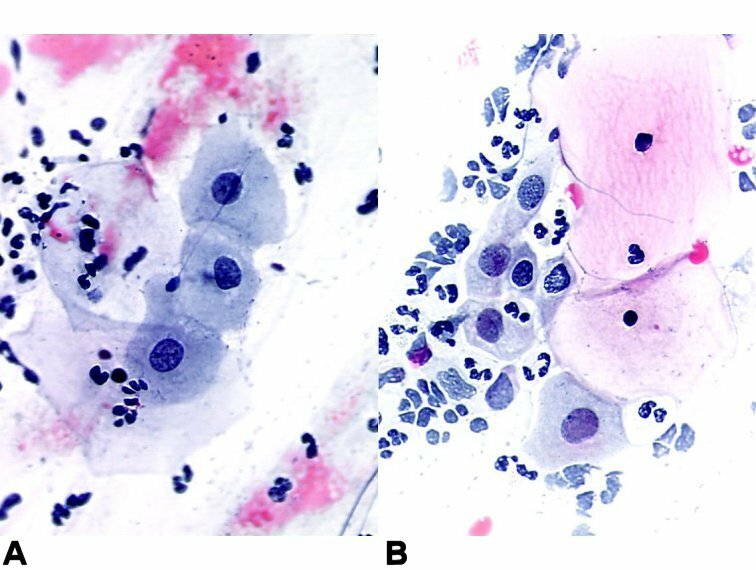 These cytologic changes are suggestive of a squamous intraepithelial lesion but they are quantitatively or qualitatively insufficient for a definitive interpretation. On the contrary, they differ from cytological changes within normal limits. In UK, these smears are called 'borderline'. In such cases the nucleus is generally around 2½ times the size of the normal nucleus and other nuclear abnormalities are absent (no frank hyperchromasia and regular outlines). When there is an inflammation, specific (such as Trichomonas vaginalis infection) or not which can explain the presence of cellular atypia, the ASC-US category should not be used.